Are you serious about improving your poker game or are you looking to move up to some of the largest tournaments online? If so, then you should consider taking the Tournament Masterclass – by Raise Your Edge which we dive into in this poker course review. Before we start, I should let you know that I ranked Raise Your Edge as the Number 1 training site in my poker training sites review page – so I am a big fan of this course and what Bencb has to offer. The Tournament Masterclass Course is taught by online poker superstar “bencb789.” He has won millions in online poker tournaments, including the 2016 PokerStars WCOOP $102,000 Super High Roller where he defeated Fedor Holz for $1.17 million. First, you need to know fundamental poker tournament strategy. This isn’t a poker course for a new poker player in the slightest – I repeat, if you are a beginner, this course is not for you! Next, you will need to have the desire and dedication to become a great poker player. If you bring those things, bencb789 will teach you all that you need to know to beat poker tournaments at the highest levels. So let’s take a look at what to expect from the Expert Tournament Masterclass in this review of RYE’s most premium content. Before the start of the course, bencb gives you an overview of what to expect and the mindset that is necessary for the Tournament Masterclass. I recommend that you watch this video in detail before purchasing the class. This video is a sampler of the course (which is very involved), and if you don’t approach it with the proper mindset, you will not achieve the results you expect from such a class. After viewing the introduction and signing up for the course, you’ll be presented with five module groups with each having their own subgroup of videos. Below is a general overview of what you’ll find in these modules. In this first section, you’ll learn all about play playing preflop, starting with an extensive discussion about hand ranges. 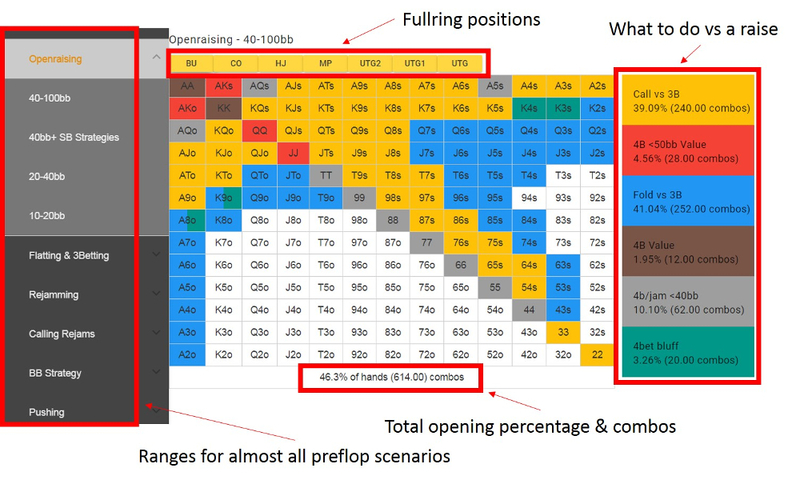 Bencb789 looks at over 200+ preflop ranges from just about every position imaginable. He also introduces you to the expert range viewer which is one of the most valuable parts of the course in my opinion. Next, he moves into talking about the theory behind developing comprehensive open raising strategies followed by putting those strategies into practice. Afterwards, you’ll learn strategies behind flat calling and 3betting preflop and also about aggressively defending your blinds. The final two sections will cover more advanced preflop concepts such as 3betting, 4betting and squeezing with 40bb+ all of which are extremely powerful if used correctly on the table. Then, he covers playing out of position as both the preflop aggressor and as a cold-caller. You will also get into more advanced concepts such as playing in 3bet pots and playing as a cold-caller in position. Also, you will learn how to apply ICM theory to your decision on whether to play your short stack. If you haven’t had much experience with ICM before (i.e. you are a cash game player), this section will really improve your game a lot. The Heads-up module consists of three sections that will focus on heads-up tournament play. 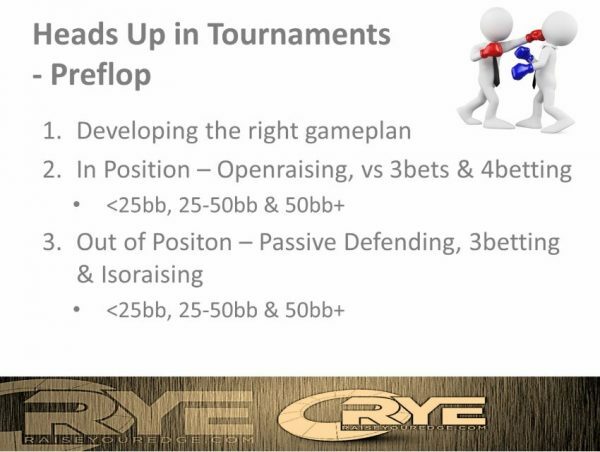 Firstly, bencb789 focuses on preflop play, focusing a lot of time on developing the right gameplan, followed by the best strategies for playing in position and strategy for playing out of position. The next section is more of a review of concepts from the first video that focuses on hand reviews from previously played tournaments. This section helps you see all of what you have learned so far put into practice and helps you reinforce critical concepts. In the last video, bencb789 plays a series of heads-up tournaments and applies ideas presented in previous videos to live play. This course provides you with ranges for almost every imaginable preflop situation. No more guessing what hands you should be opening UTG or calling vs a 3bet. You can use these ranges as a template to work from whilst analysing your opponent after a session, during a warmup or cool down. You can even use them in game if you are only running a couple of tables (note: range viewers are against the Terms of Service of most online poker sites, so be warned). Truth be told, this is one of the most valuable if not the most valuable part of the course since they are so detailed and well thought out. In the bonus content section, bencb789 presents three videos recapping his final table run in the 2016 WCOOP $100k Super High Roller. In this series of three videos, bencb789 breaks down his thought processes and helps you “bring it all together” by seeing how he applied his strategies to win the event and $1.17 million. This section was added after the original course was completed and is an excellent example of the types of updates you can expect in the future for this course. Raise Your Edges YouTube content is excellent – he always shares lots of valuable tips and strategies or looks at a big tournament he recently took down. I particularly enjoyed watching his recent streams of WCOOP and WCOOP youtube uploads where he looked at some plays he made in the final event. Here are some of the testimonials from either crushers who have worked with bencb or coaching clients. I had several skype sessions with Ben from RaiseYourEdge to work on my game and especially to prepare myself for some serious tourmaments (WSOP). In this short period of time he pointed out a lot of helpful things which I should consider during tournament play. I can honestly say he brought my game to the next level, I highly recommend his coaching as he has the ability to listen to the students’ needs and tailor-made his coaching. Money wisely spend if you like to improve your poker game and learn from one the best coaches out there. I know Ben for the biggest part of my pokercareer already. We were not just studying poker together, but were flatmates for more than a year sharing thoughts and strategies pretty much everyday. His work ethic and professionalism is outstanding and the combination of understanding theoretical concepts as well as applying those to playerpools of all levels is rarely seen out there. I decided to play the highest live tournaments out there myself and one thing I can tell you guys for sure: I’m really happy to not face my buddy Ben out there in the Live-Arena. These reddit threads(this, this and this) are also worth checking to see the general consensus of people who have bought. In the introductory video, bencb789 talked about how that you will need to commit yourself and put in the work to get the most out of this course. I completely concur, and this course may be more study intensive than any I’ve encountered in the past. I knew this course was going to be involved when the first module was an hour of non-stop discussions about ranges. It felt like a complete data dump, and there is no way a person will be able to assimilate the information in just a single viewing short of having an endemic memory. That’s par for the course with this material. This course requires more than just casual viewing. It requires you to put in the time, study and practice to master the material. Don’t be surprised if you will need to spend several hours assimilating each and every video. Some people can look at a poker situation and come up with various scenarios without a lot of effort. Others need to have a more methodical approach to each situation. Unfortunately, a lot of poker training software shies away from the methodical approach and thus alienates players who thrive under this approach. I am one of those players, and I was impressed by the methodical approach of bencb789 in this course. I’m the type of person who likes to have a plan of action for every situation. I want to plan for contingencies, and this course gives you the knowledge to do just that by giving you the tools to plan out every phase of tournament play and from just about every angle imaginable. Next, I feel this material is beyond comprehensive. The depth that bencb789 goes with each topic is better than I’ve seen from any site I’ve checked out to this point. No matter your experience level, you will benefit from this course. If you’re new to poker, your learning curve will skyrocket compared to other players with your experience. Experienced players will find tools needed to move up to the next level, win more often and perhaps achieve poker goals they set when they first started playing. In addition,, the homework assignments after each lesson are an awesome addition. Homework may be something we thought we would ever have to do again after leaving high school, but there is a reason Bencb gives you assignments – they really do work! The homework really helps you hammer down the content learned in each lesson and apply it to your game. Finally, this course will also be continuously updated as the game and its players evolve – which is comforting to know as games can evolve fast! I haev seen numerous updates to the course since I have enrolled. I am more of a hands-on and visual learner. Courses that focus more on lecture than giving examples are hard for me to sit through. Overall, I felt that this course focused a bit more on discourse than needed. Sometimes lecturing is unavoidable, but with the volume of content presented, some more visualization is required to keep things interesting. Another area where I feel this course could improve on is video length. A lot of these videos could be split up into more manageable sessions. Many 90+ minute videos could have been split up into shorter 40-50 minute videos sessions. For example, the two video about playing in position postflop could have been split into about four videos to make it more manageable. Yes, that requires a little more video editing, but students are going to be much more willing to digest 45 minutes of footage over 90+ minute videos. You need to realize that poker training should be looked at as an investment towards future profits. Like any other form of investment, sometimes you have to pay a bit more to realize a higher future return. The Apprentice Tournament Masterclass is currently priced at $739 but you can get $80 off using coupon code HOWTOAPP for a total of $659. While that sounds like a high price to pay for poker videos, you must realize that you get lifetime access to this course. Over the course of years, that’s just $50 a month. Over five years, that’s about $10 a month. Do you think you can afford to spend $10 a month over the next five years to become a better poker player? You can also jump into the Expert Tournament Masterclass if you are ready to take a full dive in this poker course. You can pick up Raise Your Edge’s flagship course for a total of $1144 with discount code HOWTOEXP which gets you $150 off. You have unlimited access to these videos 24-7, and if bencb789 updates the materials or adds new videos (which he has recently just done), you will have access to his latest strategies at no extra cost to you. The Raise Your Edge Tournament Masterclass is for anyone that wants to become better at tournament poker. However, to be truly successful with this course, you will need to put in the time, study and practice required to get better. Can the average poker player passively watch these videos and improve their game? Actually, yes they can once you have good starting fundamentals. From my own experience, I already feel I have a better understanding of specific concepts than ever before, so most anyone can learn from this course. With that said, it is not cost effective for casual players to put up $1,000+ for a poker course. In addition, if you are a new player, you will find it tough to come to grips with all of the high-level content. In that case, we would recommend another poker training site for tournaments, PokerNerve’s Road To Success course. It’s under half the price at $517 (when using coupon code HowToPlayPokerInfo) and starts from the very basics of tournament play and is therefore suitable for players who are new to the game or who have never studied intently before. However, if you’re a serious tournament player who wants to up their game the tournament masterclass and bencb789 is exactly what you have been looking for. It has all the right content and tools (hand range viewer) you need to take your game to a new level. I already mentioned this in the intro, but I think this is the best poker training site you can get your hands on in 2019 for a number of reasons. Make sure you take advantage of our Raise Your Edge discount codes if you do decide to jump in. The Tournament Masterclass will give you everything you need to improve your tournament strategy and start winning more often. While you never know what the future will hold, this course will put you in the best position to make your poker dreams a reality. Content Organisation: All content is very easy to follow and find. Value for money: Great value for money, particularly with the preflop range viewer which is almost worth the price of admission alone.